The 36th (Ulster) Division was a division of Lord Kitchener‘s New Army formed in September 1914. Originally called the Ulster Division, it was made up of members of the Ulster Volunteer Force, who formed thirteen additional battalions for three existing regiments: the Royal Irish Fusiliers, the Royal Irish Rifles and the Royal Inniskilling Fusiliers. The division served on the Western Front as a formation of the British Army during World War I. 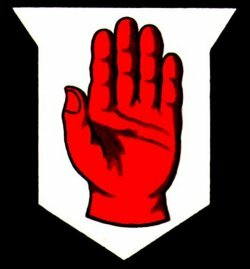 The division’s insignia was the Red Hand of Ulster. The Ulster Volunteers were a unionist militia founded in 1912 to block Home Rule for Ireland. In 1913 they organised themselves into the Ulster Volunteer Force to give armed resistance to the prospective Third Home Rule Act (enacted in 1914). With a rival Irish Volunteers being formed by nationalists in response, outright civil war in Ireland seemed possible. However, the outbreak of World War I intervened: the Act was put in abeyance until after what was expected to be a short war. The leading battalions (of the 36th (Ulster) Division) had been ordered out from the wood just before 7.30am and laid down near the German trenches … At zero hour the British barrage lifted. Bugles blew the “Advance”. Up sprang the Ulstermen and, without forming up in the waves adopted by other divisions, they rushed the German front line ….. By a combination of sensible tactics and Ulster dash, the prize that eluded so many, the capture of a long section of the German front line, had been accomplished. During the Battle of the Somme the Ulster Division was the only division of X Corps to have achieved its objectives on the opening day of the battle. This came at a heavy price, with the division suffering in two days of fighting 5,500 officers and enlisted men killed, wounded or missing. War correspondent Philip Gibbs said of the Division, “Their attack was one of the finest displays of human courage in the world. Of nine Victoria Crosses given to British forces in the battle, four were awarded to 36th Division soldiers. An arch in the Shankill Road area of Belfast commemorating the 36th Ulster Division. Thiepval, as a battle memorial, commemorates the 1916 Anglo-French offensive on the Somme. It pays tribute and respect for those who died where it stands (90% of commemorations 1 July – 13 November 1916) and is the biggest British war memorial to the missing of The Western Front, both in physical size and the numbers it commemorates (more than 73,000). It was built in the late 1920s to early 1930s. The 36th Ulster Division’s sector of the Somme lay astride the marshy valley of the river Ancre and the higher ground south of the river. Their task was to cross the ridge and take the German second line near Grandcourt. In their path lay not only the German front line, but just beyond it, the intermediate line within which was the Schwaben Redoubt. To their left flank was the 29th Division, which included the Newfoundlanders. For them in less than half an hour it was all over; 801 men went into action and on the unwounded name call next day, only 68 answered. To their right flank was the 32nd Division, including the Grimsby Chums. Prior to the attack at 07:28 a large mine was exploded beneath the German line; the Chums would then attack at 07:30. Unknown to them, the mine was short of the German position. During the 2-minute gap between explosion and whistle, the Germans set up their machine guns, probably in the new bunker which would give them a second defense. The attack did not last long; their task was to take the fortress village of Thiepval. The First Day of the Somme was the anniversary (Julian Calendar) of the Battle of the Boyne, a fact remarked on by the leaders of the Division. Stories that some men went over the top wearing orange sashes are, however,sometimes thought to be myths. On 1 July, following the preliminary bombardment, the Ulstermen quickly took the German front line. But intelligence was so poor that, with the rest of the division attacking under creep bombardment (artillery fired in front or over men; they advance as it moves), the Ulstermen would have come under attack from their own bombardment at the German first line. But they still advanced, moving to the crest so rapidly that the Germans had no time to come up from their dugouts (generally 30–40 feet below ground). In the Schwaben Redoubt, which was also taken, so successful was the advance that by 10:00 some had reached the German second line. But again they came under their own barrage, not due to finish until 10:10. However, this successful penetration had to be given up before nightfall, as it was unmatched by those at its flanks. The Ulstermen were exposed in a narrow salient, open to attack on three sides. They were running out of ammunition and supplies, and a full German counter-attack at 22:00 forced them to withdraw, giving up virtually all they gained. The Ulstermen had gained an advantage on the day of battle by not sticking to the rigid orders issued. Both the German and British generals considered the men of the New Army/Kitcheners Men as insufficiently trained in the skills of warfare. Consequently, the battle tactics they were ordered to follow by commanders was more strict and regimented than those of regular army. But the Ulstermen advanced during the bombardment by pushing forward small trenches the depth of a man, then cutting the barbed wire which was 30 inches in depth and height in places (before bombardment). So when the bombardment stopped at 07:28/07:30 the Ulstermen attacked quickly. These Ulstermen were also here by choice. Kitchener asked Sir Edward Carson for some of the already armed men of the Ulster Division. He hoped for a Brigade (4x battalions), he got in Volunteers, a Division (3x Brigade). Thiepval was not to fall until late September; the Schwaben Redoubt fell in mid-October. The battle ended in mid-November. The Allies advanced 8 km and the British suffered 420,000 casualties, the French 195,000, and the Germans 650,000. The only success was relieving the French at Verdun. On the first day of battle, the British suffered 57,740 casualties, of which 19,240 were dead (the largest single loss). 60% of the officers involved were killed. The Ulster Memorial Tower was unveiled by Field-Marshal Sir Henry Wilson in Thiepval, France, on 19 November 1921, in dedication to the contributions of the 36th Ulster Division during World War I. The tower marks the site of the Schwaben redoubt, against which the Ulster Division advanced on the first day of the Battle of the Somme. Lord Carson had intended to perform the unveiling himself, but due to illness, his place was taken by Field Marshal Sir Henry Wilson. The money was raised by public subscription in Northern Ireland in memory of the officers and men of the 36th (Ulster) Division, and all Ulsterman who died in the great war. The tower itself is a replica of Helen’s Tower at Clandeboye, County Down. It was at Helen’s Tower that the men of the then newly formed Ulster Division drilled and trained on the outbreak of World War I. For many of the men of the 36th (Ulster) Division, the distinctive sight of Helen’s Tower rising above the surrounding countryside was one of their last abiding memories of home before their departure for England and, subsequently, the Western Front. Captain Eric Norman Frankland Bell, 9th Battalion The Royal Inniskilling Fusiliers. Died 20 years old, 1 July 1916, Battle of the Somme. 2nd Lieutenant James Samuel Emerson, 9th Battalion The Royal Inniskilling Fusiliers. Died 22 years old, 6 December 1917, La Vacquerie. Lance Corporal Ernest Seaman, 2nd Battalion The Royal Inniskilling Fusiliers. Died 25 years old, 29 September 1918, Terhand Belgium. Fusilier Norman Harvey, 1st Battalion The Royal Inniskilling Fusiliers. Awarded for actions during 25 October 1918, Ingoyghem, Belgium. Second Lieutenant Edmund De Wind, 15th Battalion The Royal Irish Rifles. Died 34 years old, 21 March 1918, Second Battle of the Somme. Rifleman William Frederick McFadzean, 14th Battalion The Royal Irish Rifles. Died 20 years old, 1 July 1916, Battle of the Somme. Rifleman Robert Quigg, 12th Battalion The Royal Irish Rifles. Awarded for actions during the Battle of the Somme on 1 July 1916. Also awarded the Medal of Order of St. George (Fourth Class), the highest honour of the Russian Empire. Lieutenant Geoffrey Cather 9th Battalion The Royal Irish Fusiliers. Died 25 years old, 2 July 1916, Battle of the Somme. Private Robert Morrow, 1st Btn Royal Irish Fusiliers. Died 23 years old, 26 April 1915, Battle of Messines. After the war had ended, King George V paid tribute to the 36th Division saying, “I recall the deeds of the 36th (Ulster) Division, which have more than fulfilled the high opinion formed by me on inspecting that force on the eve of its departure for the front. Throughout the long years of struggle, which now so gloriously ended, the men of Ulster have proved how nobly they fight and die …”. Whether town dweller or country lad, volunteer or regular, officer or other rank, Catholic or Protestant, the Sons of Ulster knew a comradship and a trust in adversity that should be a lesson to us all. On 29 August 1917, the 8th and 9th battalions of the Royal Irish Rifles amalgamated to form the 8/9th Battalion, which disbanded on 7 February 1918. Between 6 November 1915 to 7 February 1916 the brigade swapped with the 12th Brigade from the 4th Division. In August 1917 the 11th and 13th battalions of the Royal Irish Rifles amalgamated to form the 11/13th Battalion, which disbanded in February 1918. 109th Trench Mortar Battery (from 1 April 1916). Ulster Tower Memorial Thiepval, France. Island of Ireland Peace Park Messines, Belgium.